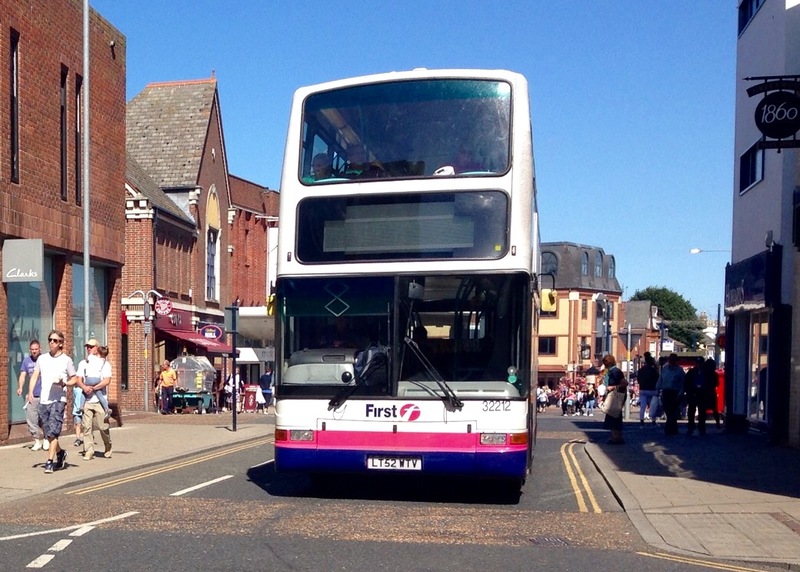 The latest Notice & Proceedings Report was published by the East of England Traffic Commissioner this morning and the foregoing is a detailed summary of changes in the local area during the fortnight under review. The 2016 Great Yarmouth Festival of Bowls began last Sunday and continues until 23 September. This is reportedly the largest outdoor open bowling event in the country attracting more than 1200 competitors. 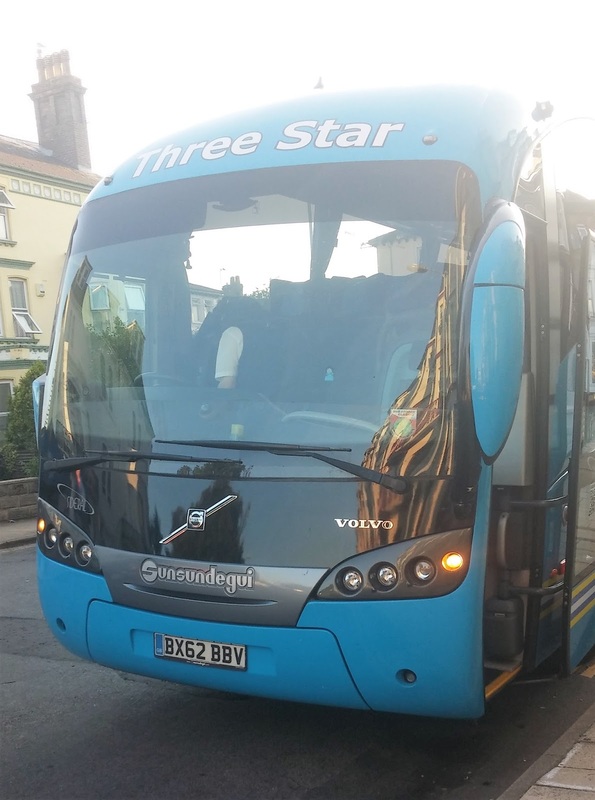 The coach was Sunsundegui Sideral bodied Volvo B9R BX62BBV - a coach I photographed at Beach Coach Station in August 2013! The annual event, now in its 31st year, aims to give children with disabilities, or from disadvantaged backgrounds, a day they will never forget. Passing the garage in Caister this morning I noted two fresh arrivals for Reynolds, I was informed that they were collected on Saturday. Both are Plaxton bodied and look to be a shorter wheelbase version; registrations are AT55CZH/AT55CZJ. 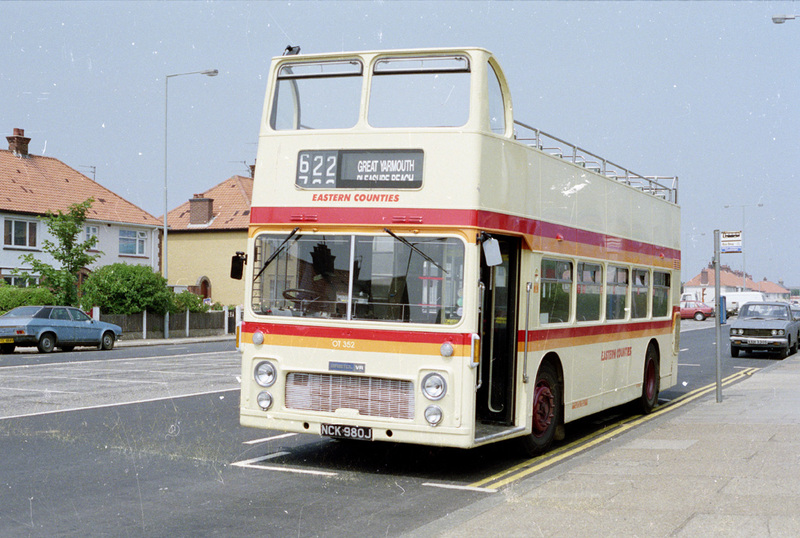 Been a while since we had a photo special and as a lot of interest in a certain open top vehicle appearing once more along Yarmouth sea front i thought a nice trip down memory lane is in order!. 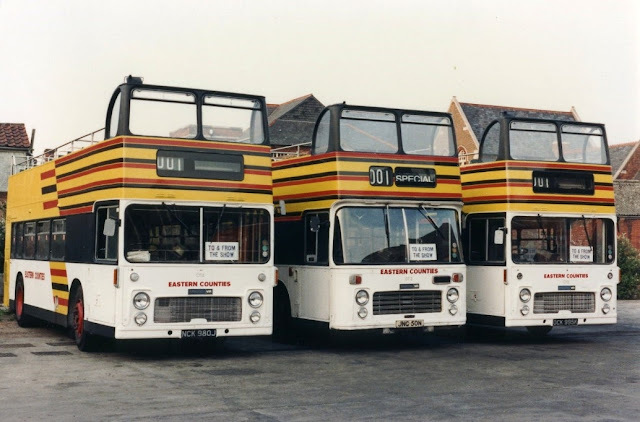 With the help of David Waters and the late Jim Long i have a selection of Photos showing the many looks of the Open Top Bristol VR's operated by Eastern Counties back in the day. First photo goes back to May 1987 and three open toppers are pictured at Ipswich depot ready for use on shuttle duties to and from what i presume would have been the Suffolk Show. All in the livery which was named the Wasp!. 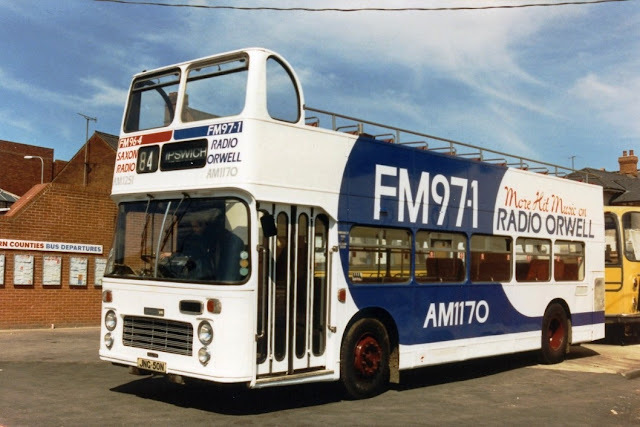 A year on to 1988 and JNG50N is pictured at the Old Cattle Market Bus Station in Ipswich wearing a livery showing two local Radio stations, it was Blue on one side for Radio Orwell with Saxon Radio being promoted in Red on the other. Next up is OCK995K pictured at Lowestoft Depot wearing the dark blue version of Pleasurewood Hills livery, a lighter version was also worn by the vehicles. 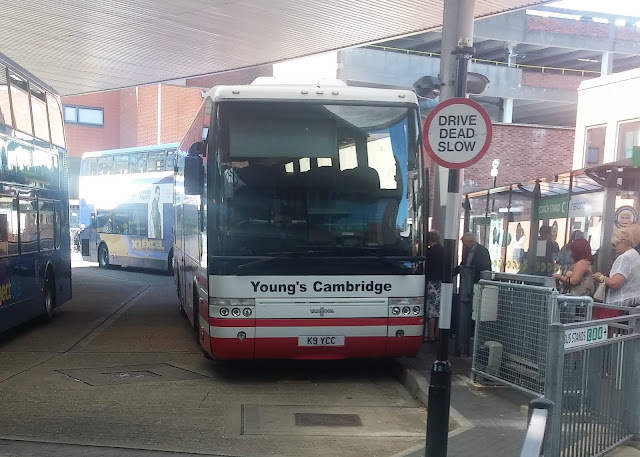 Finally we see NCK980J parked opposite the Pleasure Beach freshly painted in a variation of the privatised coach style livery, note its fleet number has changed from OT4 to OT352 at this point. Many thanks to David Waters and our good friend Jim Long for supplying the photographs of these vehicles in their many guises. A couple of interesting vehicles were on display at Great Yarmouth's Beach Coach Station this afternoon. The first was unusual in that it was an Auwärter N122/3 double deck coach bearing the registration M155HST. Owned by Barker Bus of Roydon, Essex it was built to a CH57/18Ct configuration. 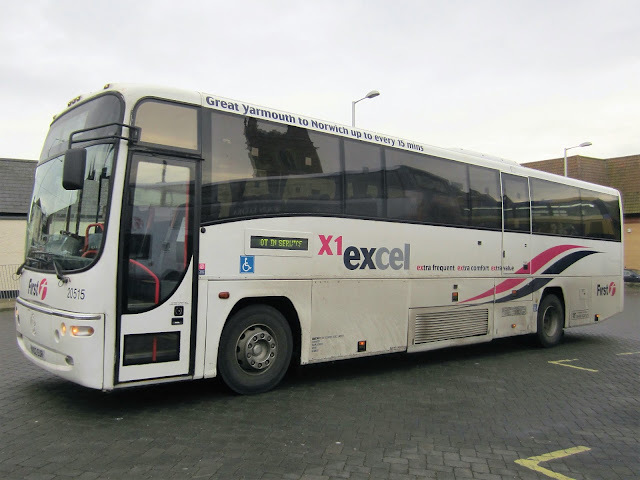 The coach was new to Trathens Travel Services of Plymouth as YN51XMW in October 2001. I received an email earlier this morning from a regular contributor Thomas Baker. He reports that he recently had a holiday in Cornwall staying at Marizion where the weather was hot and sunny with blue skies. (just like today then!) 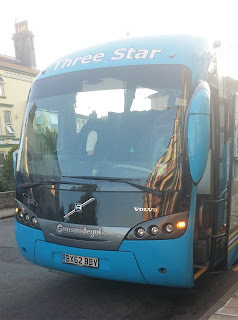 Whilst there he took a trip to Helston about 10 miles from Penzance. 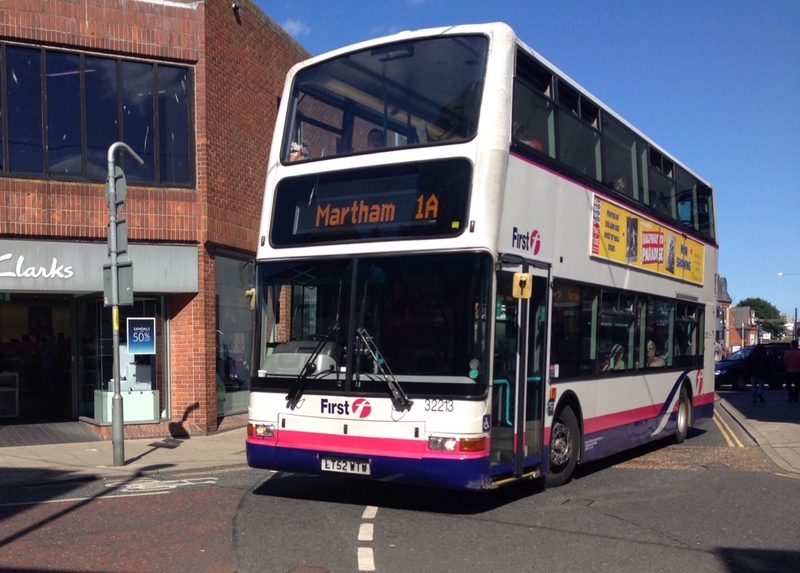 Whilst looking around, a familiar First bus stood out in the form of ex Great Yarmouth decker 32208 (LT52WTO). 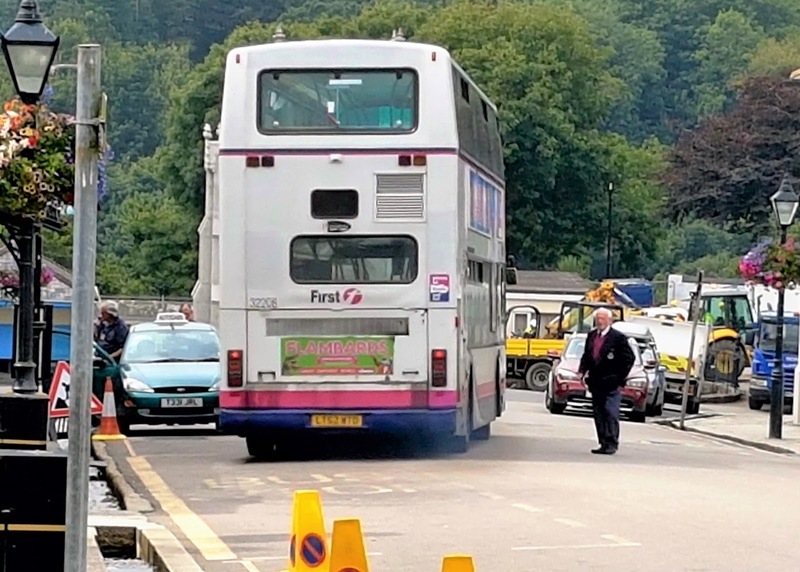 As he says 'It just shows that these buses certainly get around'. 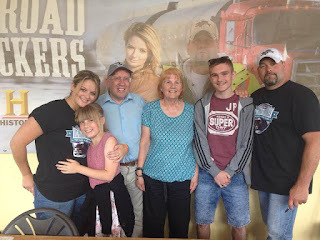 A rare photo of yours truly appears on the blog! Among the refreshment areas was a Bus Bar; this was well preserved Willowbrook Viscount bodied AEC Reliance 935GTA new to Devon General (also known as Grey Cars) in June 1961. 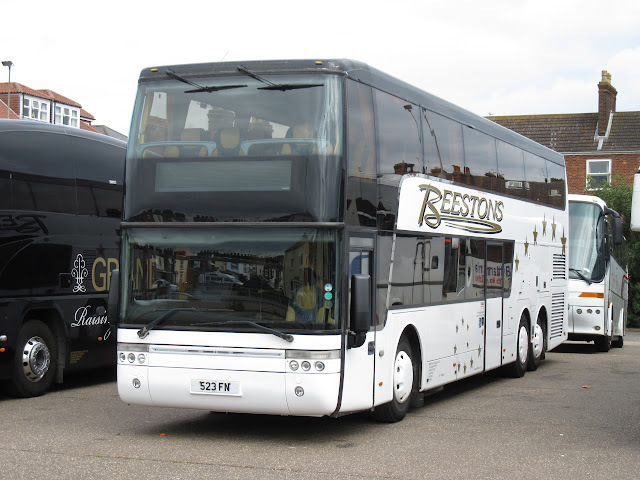 The coach is adorned with its Devon General fleet number of TCR935 and carries destination blinds showing 'Grey Cars' and 'Mystery Drive' ! They were specially fitted with passenger lifts and initially operated under special dispensation on the Bath - London service. The advent of lifts within the front entrance meant that these vehicles remained unique. As you may already be aware, the business of Ipswich based operator Soames of Otley had been made available for sale following the announcement that director Tony Soames is retiring. 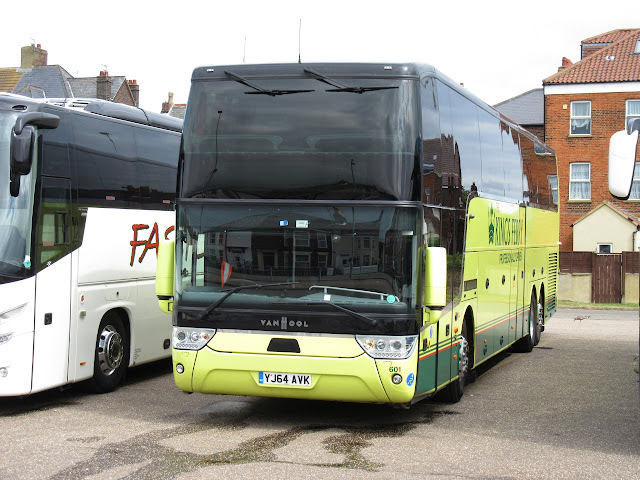 RouteONE magazine announced yesterday that the business, which trades as 'Forget Me Not Travel' has been acquired by Suffolk Norse, the Norfolk and Suffolk County Council owned operator. 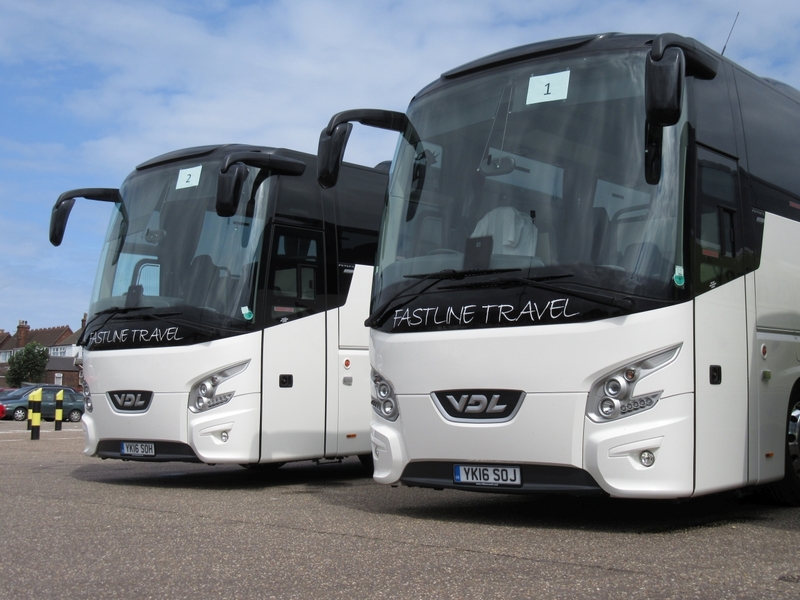 Sunday saw a few visitors to Beach Coach Station and two notable ones were a pair of brand new VDL Futura 2's belonging to Fastline travel of Walsall in the West Midlands. 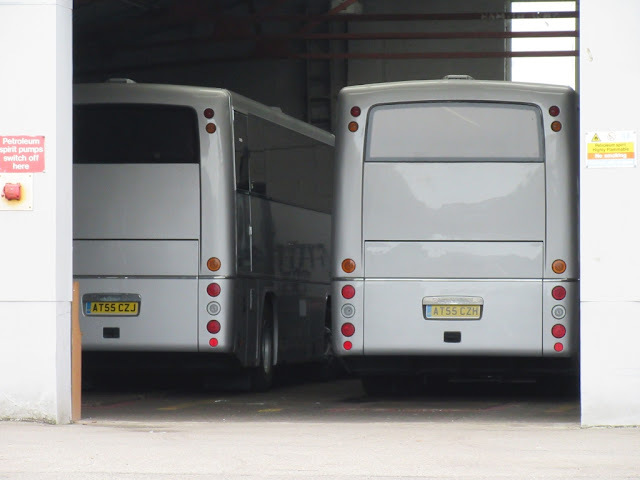 YK16SOH & YK16SOJ were both new in April this year. Other notable visitors yesterday included Beestons Double Deck Van Hool 523FN, a registration that many locals would recognise from former Yarmouth operator Caroline Seagull as many of their fleet carried the old East Kent FN reg mark at one time or another. Finally another impressive visitor from Kings Ferry in the shape of YJ64AVK a Van Hool TDX21 from the long standing Kent operator. 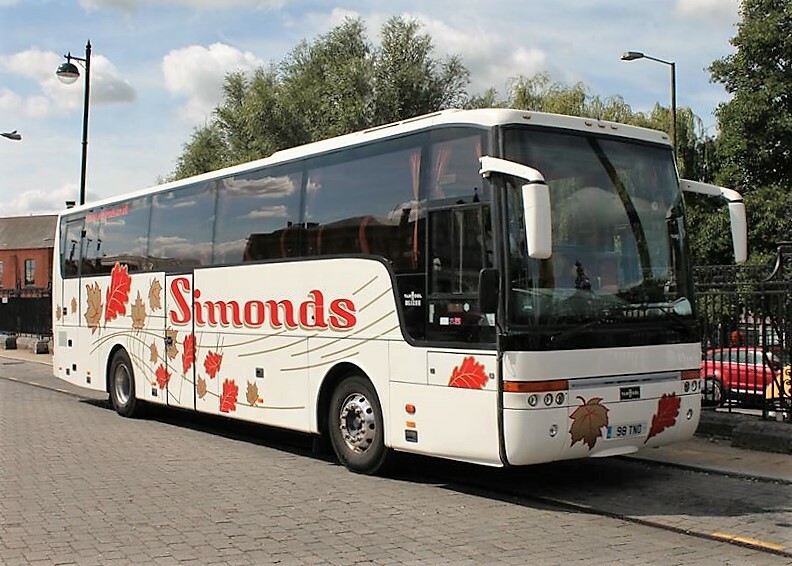 Update: Unfortunately the Ayats Bravo caught fire on the A11 at Wymondham this evening on the return journey. The road was closed for a time whilst the fire was brought under control. Importantly no one was hurt. A report appeared in the local newspaper, the Eastern Daily Press, which can be viewed HERE My thanks to Mark Cockerell for making me aware of it. 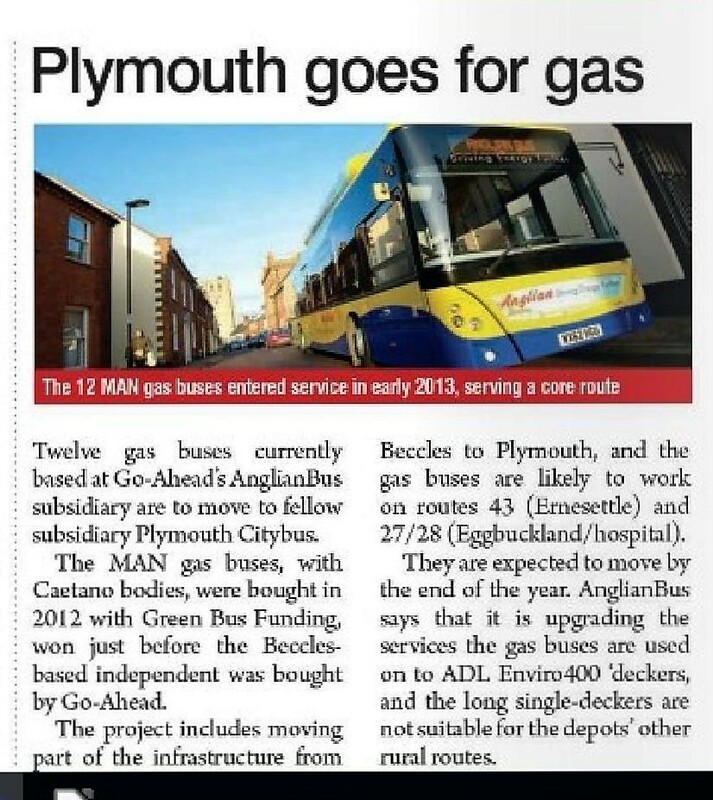 After many months of speculation, today's Route ONE magazine carried a report that Go Ahead subsidiary Plymouth Citybus were to receive gas buses from another subsidiary Beccles based Anglianbus. 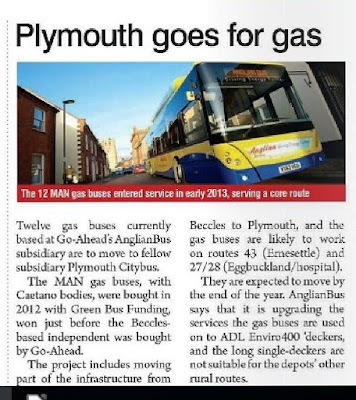 Graham Richardson, who publishes the 'Plymothian Transit Bus Blog', has confirmed the move after speaking to the Managing Director there. 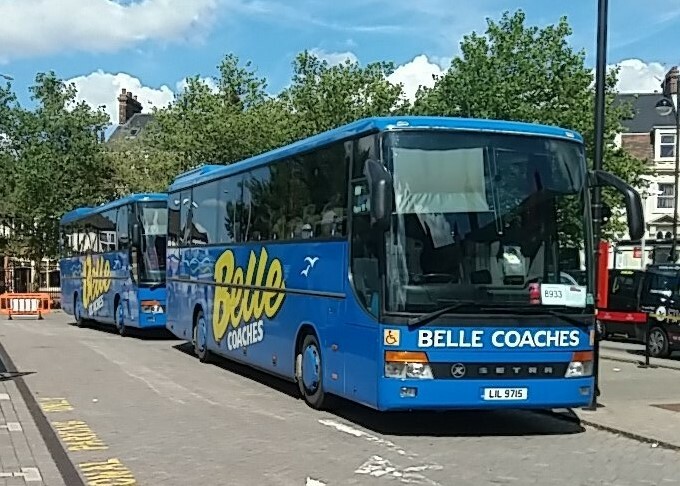 Quite a lot of fleet activity at Anglian in the last week or so - which now brings the total number of active buses in the fleet to a low of just 30! As regular blog readers will know, Anglianbus recently revised their 61 route through Great Yarmouth via Gorleston's Magdalen Estate, terminating at Barrack Estate. 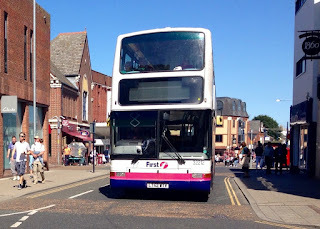 We are just about getting used to seeing gas buses and Anglian deckers running through areas of the town previously alien to them. 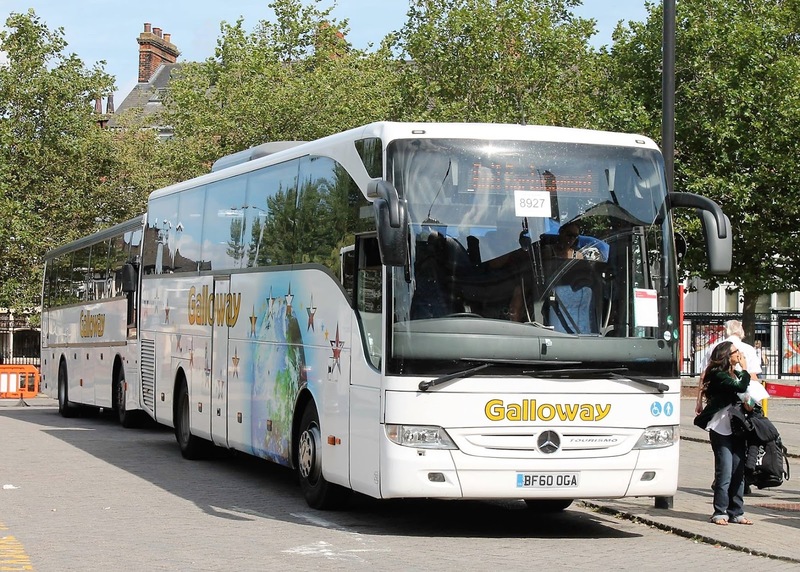 So imagine Colin White's surprise when he sees a Konectbus passing through Magdalen Estate yesterday! 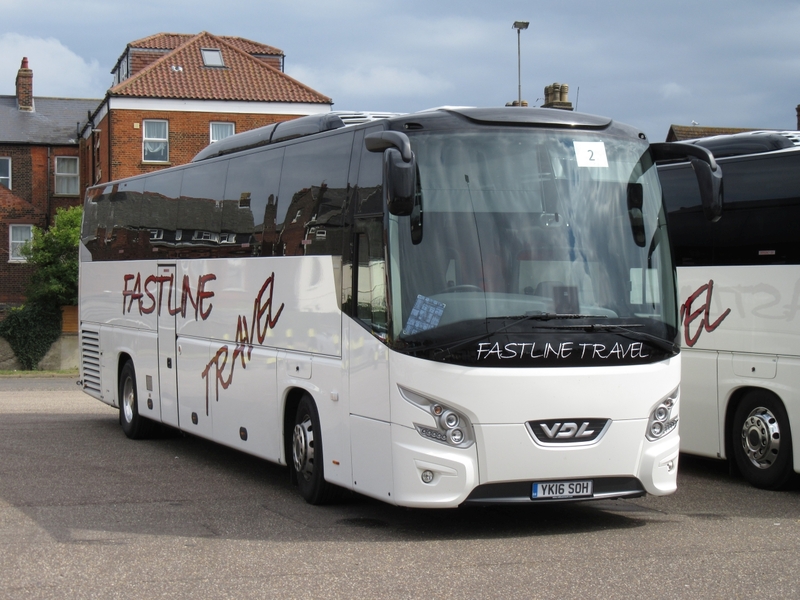 The 2016 Worthing Seafront Bus Gathering and Running Day was held on Sunday last and marks 30 years since the deregulation of the bus industry. Having taken some 70 or so photos it has been difficult to decide what to include in this post and what to leave out. However, I had no hesitation in including Southern Transit's Open Topper LDX76G. As you may have guessed from the registration, it is an ex Ipswich Leyland Atlantean PDR1/1 delivered in November 1968 as No 76. The ECW body was originally H43/31F. 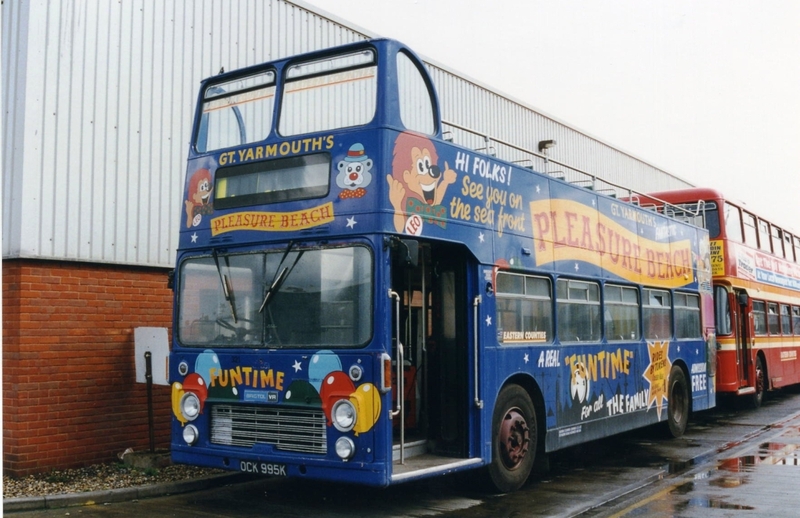 This vehicle was later sold to Eastbourne and converted to open top. I trust the above has given you some of the flavour of the vehicles at the gathering and in the photos taken on the day now appear in an album on my Flickr site.